This is a brand-new arrival from Brazil … and imagine my surprise when I discovered yet another whole new starbrary! 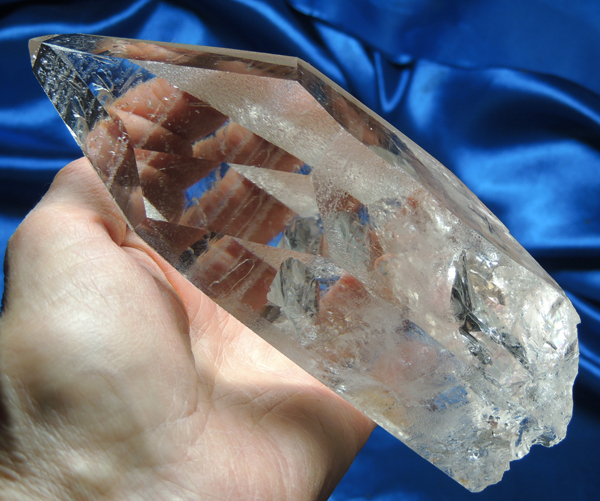 This one is a very clear and slightly smoky 1 lb 2.7 oz, 5.85” by 2.4” by 1.9” quartz point with a huge past timeline … when they are this size, they are called an ancestral timeline. Ancestral timelines help to facilitate contact with our Star ancestors. Plus, his termination holds a large Isis (five-sided) face with an adjoining Osiris (six-sided) face! The faces hold record keepers and curious, round markings … they are subtle so best to check them with a loupe! Like the Libra, all sides have starbrary glyphs but some have sides only have a few. The glyphs are sweeping and seem to describe movement from top to bottom like flying saucers or some kind of space craft and in fact, you will see “rising pyramids” among the tiny and starbrary etchings on one side. These etchings make him look less clear than he is and some have to be read from the opposite side! Many rainbows feature in his slanted base and he is in excellent condition (only very tiny dings) and he looks forward to gracing your star altars! The legends of the love Egyptian goddess Isis had for her beloved Osiris inspire the perfection of unity between Earth and divine. It represents one of the greatest loves in history, showing us that love transcends life, death and time. It is eternal, always and forever. Isis is magic, the giver of life, wisdom and teaching – the symbol of femininity and all that is ‘yin’. Osiris is the yang, in perfect balance to the yin. She truly speaks to eternal love in all its facets and is a crystal that one lover might give to another as a measure of the beloved nature they share.